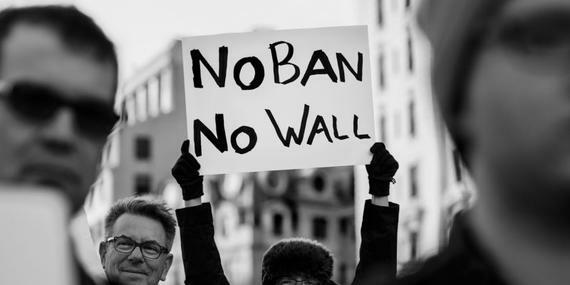 No to the Muslim Ban: after the executive order of President Trump that blocked access to refugees and Muslims in the US, we are calling for a protest of civil society: a sit-in will take place next Thursday, February 2, at 5pm, in front of the US Embassy in Rome, in via Vittorio Veneto 121. With this initiative, we want to show support to the American civil society, that in these days, is protesting vigorously – on the street and in court – against the illiberal, discriminatory, dangerous measures enacted by President Donald Trump. The protest focuses on discrimination against Muslims and refugees, but also denounces several decisions by President Trump that clearly show a discriminatory intent, and foster hatred and racism, from torture to women’s rights. We have supported the American people before: after the massacre in Orlando, we organized a similar initiative, Rome for Orlando. Today we cannot remain silent: these are inhuman measures, that violate the United States Constitution and the Universal Declaration of Human Rights . CILD works closely with the American Civil Liberties Union, the American NGO that is currently at forefront in defending the rights of people affected by what has been called “Muslim ban”. We hope that the Italian civil society will mobilize and that a firm response by the Italian institutions follows: we do not forget that our Constitution, in its fundamental principles, states strongly rejects discrimination on religious basis and mistreatment of foreign nationals. These organizations will join the sit-in: A Buon Diritto, Amnesty International Italia, Amnesty Lazio, Antigone, ARCI, ASGI, Atletico Diritti, Avvocati Per Niente, Baobab Experience, Certi Diritti, Cipsi, CIR, Cittadinanzattiva, Cittadini del Mondo, Comitato 3 Ottobre, Cospe, K_Alma, Fuoriluogo, LasciateCIEntrare, Possibile, Progetto Diritti Onlus, Radicali Italiani, Sinistra Italiana, UCOII – Unione delle Comunità Islamiche d’Italia. Next PostCILD joins the Civic Solidarity Platform!